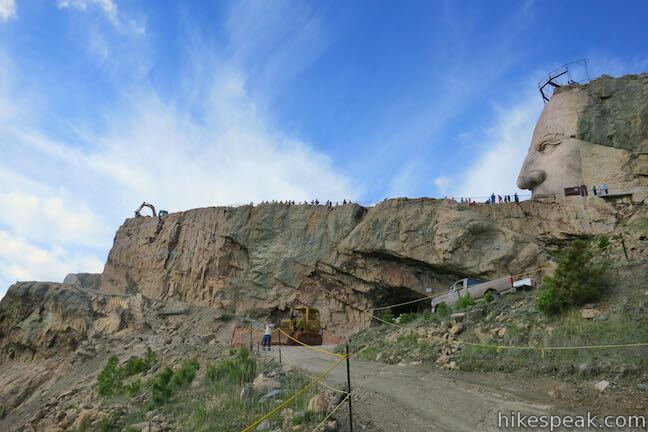 It is not every day that you can hike to the top of a 563-foot tall granite carving honoring an American legend. 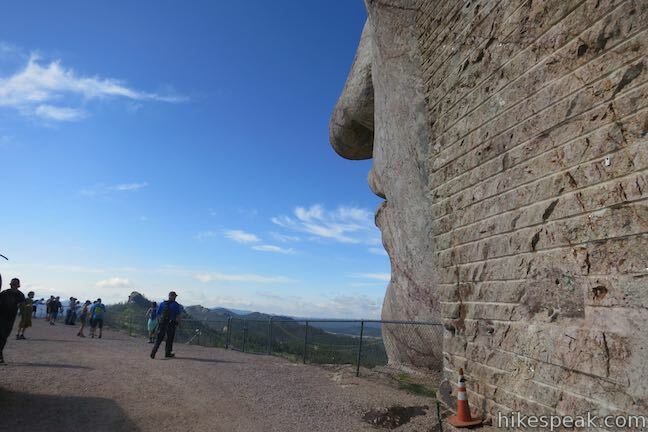 Actually, you can only do this hike a few days a year when the active construction on Crazy Horse Memorial is suspended so that the public can get a close look. 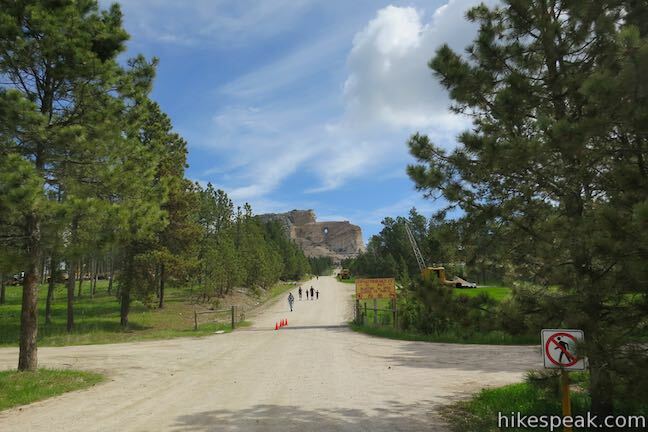 The hike passes through forests and fields below the work-in-progress memorial and follows the same road used by construction vehicles up to the arm of the monument where you can walk out and stand below the 8-story tall face of Crazy Horse! 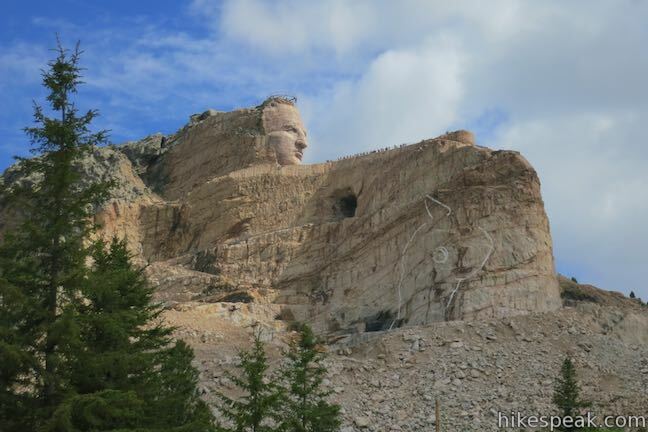 Even without the hike, Crazy Horse Memorial is a top attraction in the Black Hills of South Dakota. 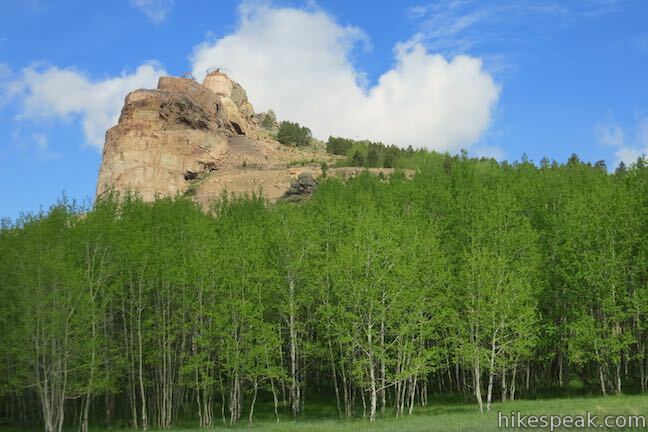 The elusive trek to the top is worth planning your trip around, measuring 6.2 miles (10 kilometers) or less with 775 feet of elevation change. 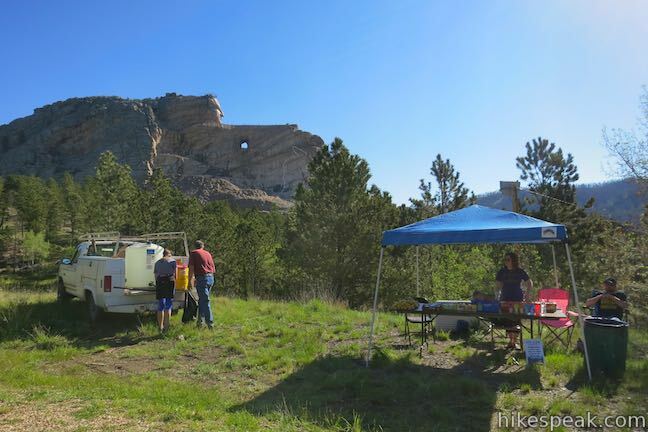 The 2019 dates for the Crazy Horse Volksmarch are June 1st, June 2nd, and September 29th. 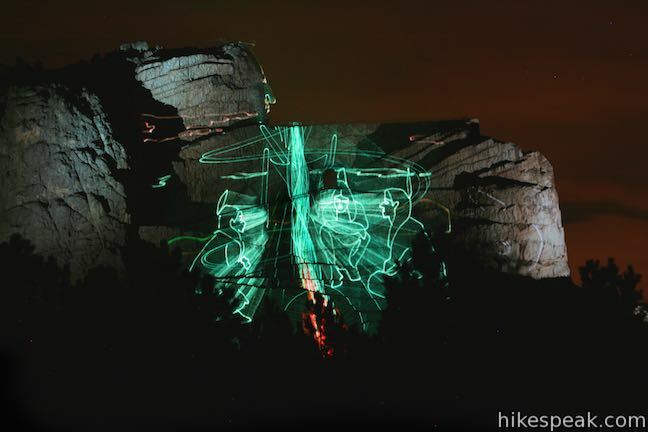 The Black Hills are considered sacred lands to the Lakota, who refer to the area as “the heart of everything that is.” Interestingly, in satellite images the Black Hills resemble the shape of a human heart. 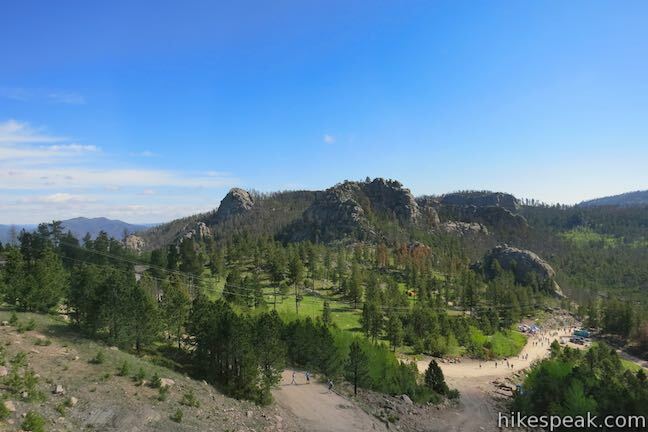 As a sacred land, the Black Hills, or Paha Sapa, were used by the Lakota for ceremonies, vision quests and burials. 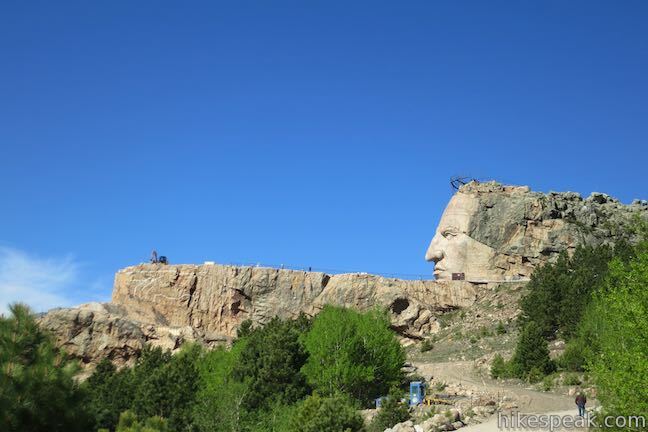 Due to its cultural value to the Native Americans, the U.S. government agreed in the Fort Laramie Treaty of 1868 to guarantee the Lakota ownership of the Black Hills and prevent any white settlements. 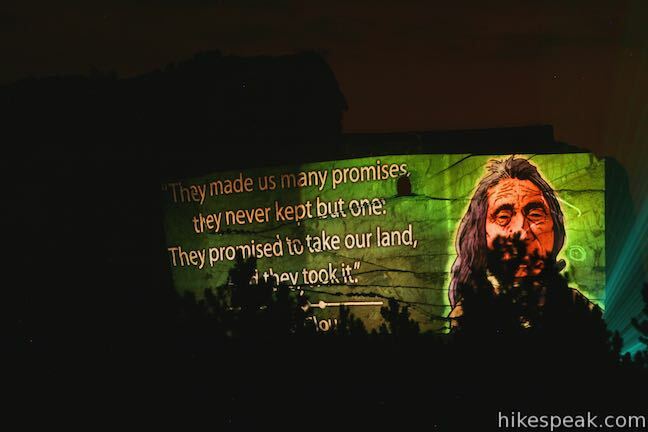 However, when small amounts of gold were found in the area six years later, the native tribes were forced out of the Paha Sapa and onto reservations. 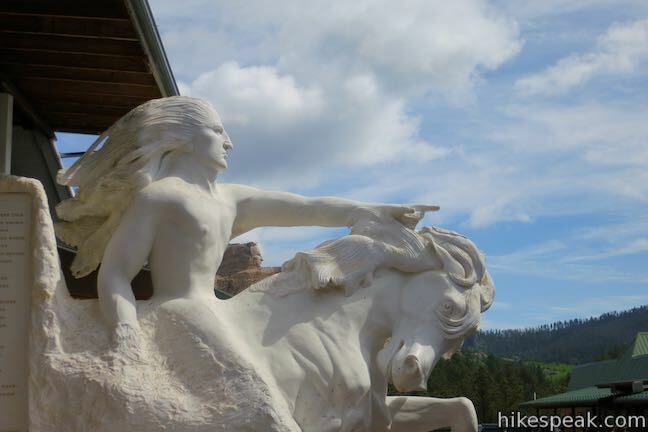 Crazy Horse, a leader and legendary warrior of the Lakota, fought to preserve their values and land by resisting the move to reservations. 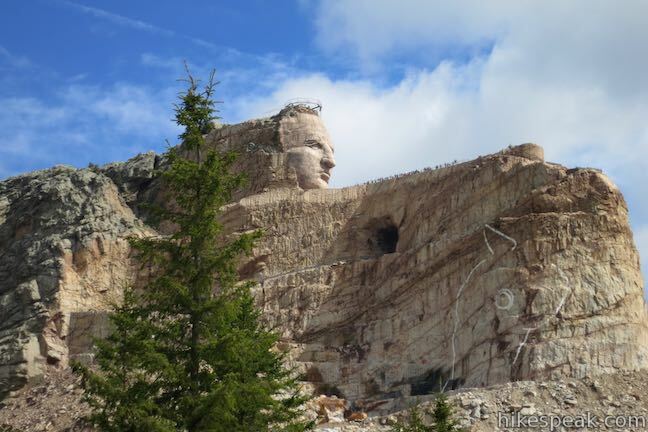 After much fighting and the decline of buffalo populations, Crazy Horse was forced to surrender in May of 1877, one of the last chiefs to do so. 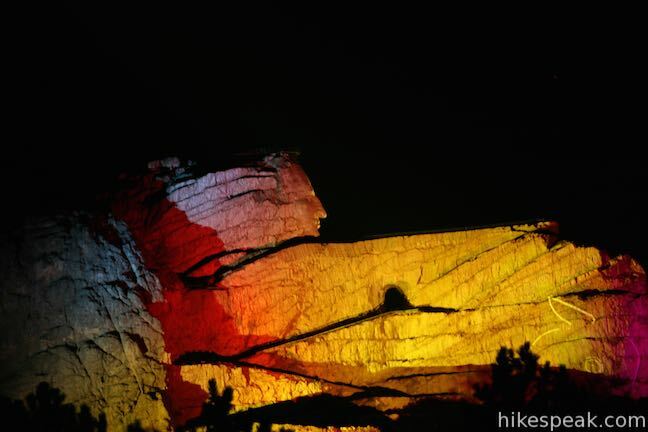 In September of that year, Crazy Horse left the reservation without permission to take his sick wife to her parents. 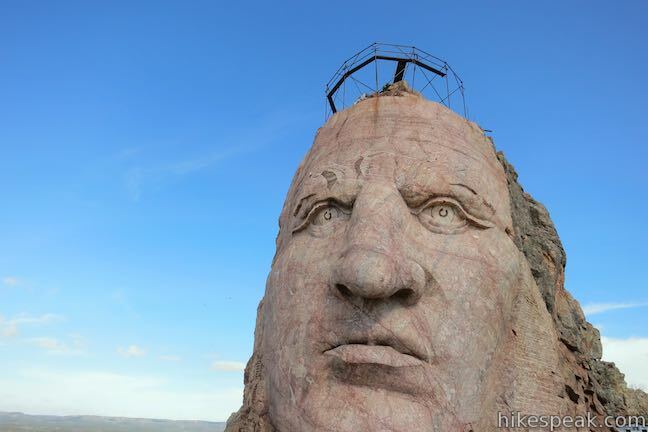 General Crook feared Crazy Horse was plotting an attack and ordered his arrest. 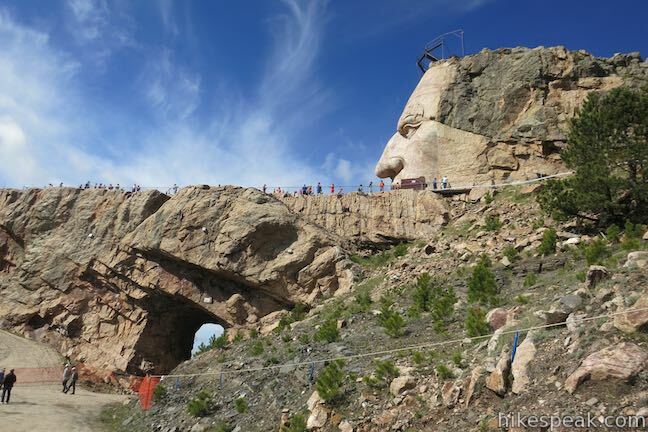 Crazy Horse did not resist arrest but when he realized he was being taken to a guardhouse and not back the reservation, he began to struggle. 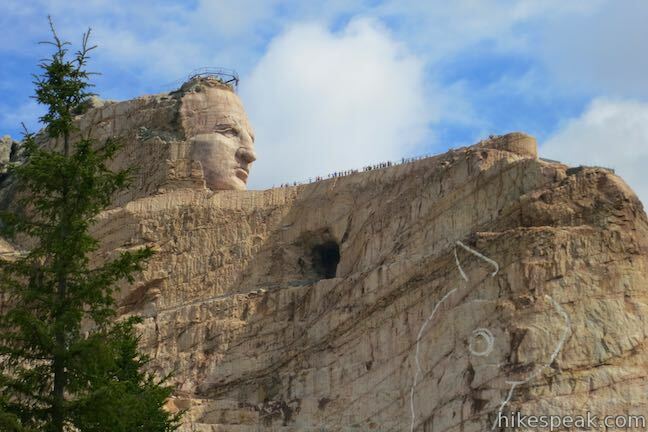 While Crazy Horse was restrained by soldiers, he was stabbed in the back with a bayonet and died from the injuries. 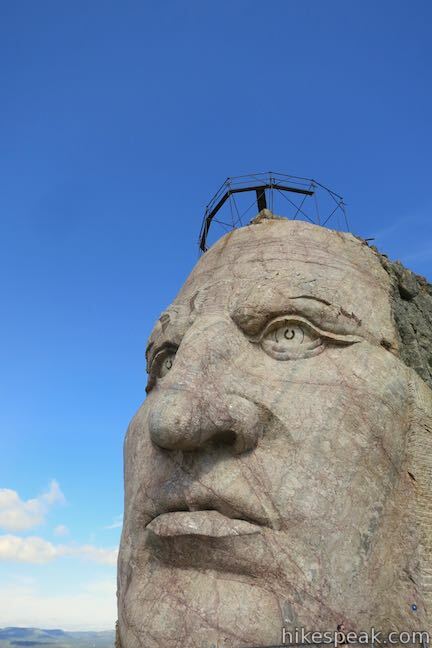 The Mission of Crazy Horse Memorial Foundation is “to protect and preserve the culture, tradition, and living heritage of the North American Indians.” In addition to continual work on the sculpture, the foundation has created Indian University of North America, which offers scholarships and summer programs to Native American college students. 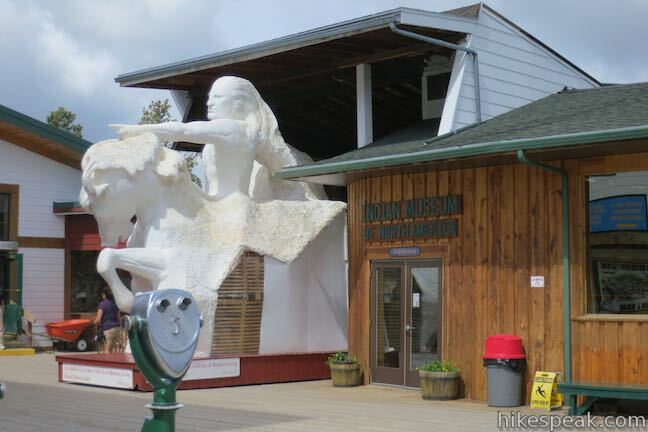 They have also created the Indian Museum of North America and the Native American Educational and Cultural Center on the campus of the memorial. 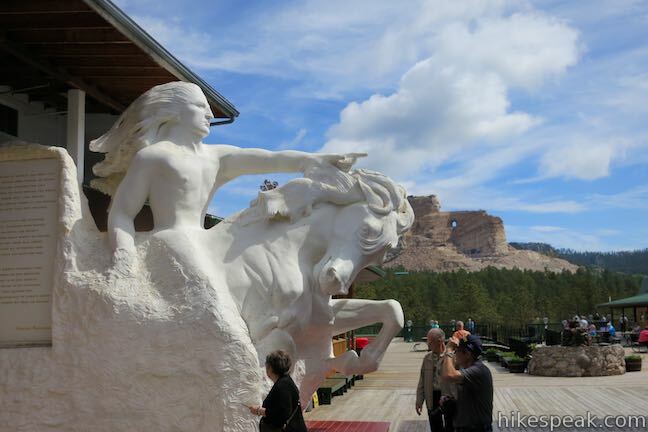 Tip: If you can, visit the beautiful and informative museum the day before hiking so that you can learn about Crazy Horse and Korczak. 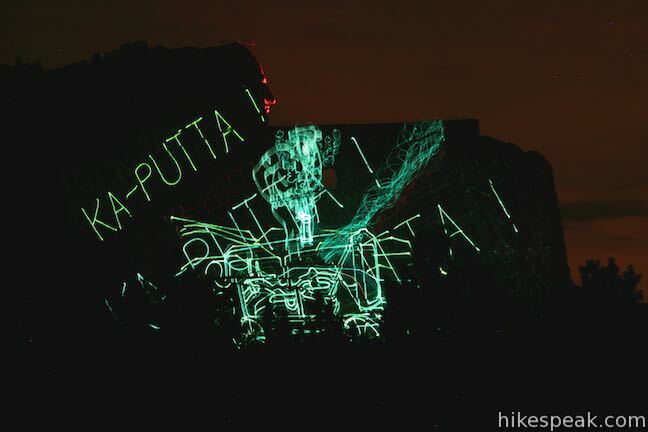 At the end of your visit, request a free re-admittance pass that is good for the evening laser light show as well as entry the following day when you set out on the hike. 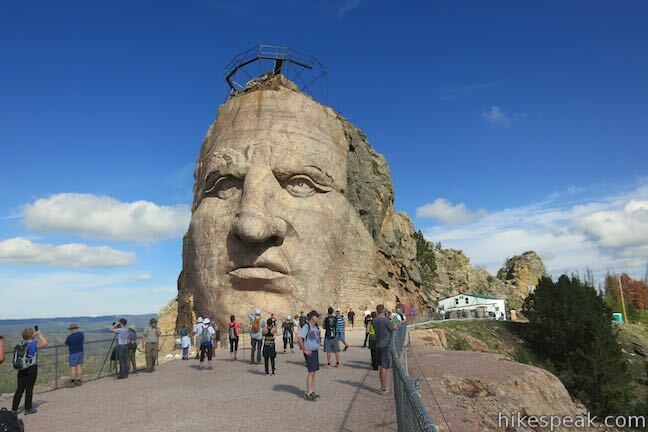 The tradition of opening the monument to hikers began in 1985. 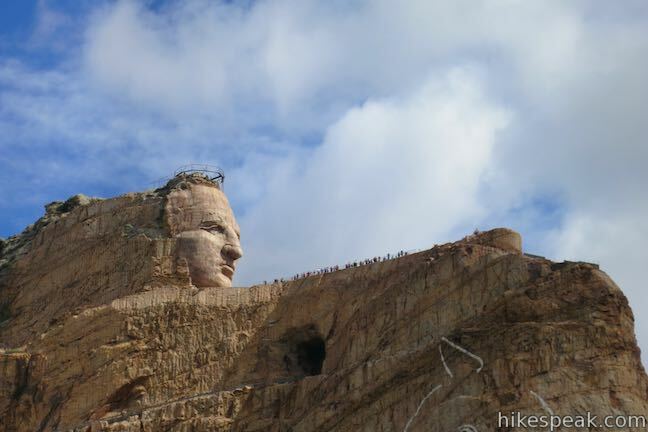 The “Crazy Horse Volksmarch” now attracts thousands of hikers each year with 15,000 participants reported in 2013. 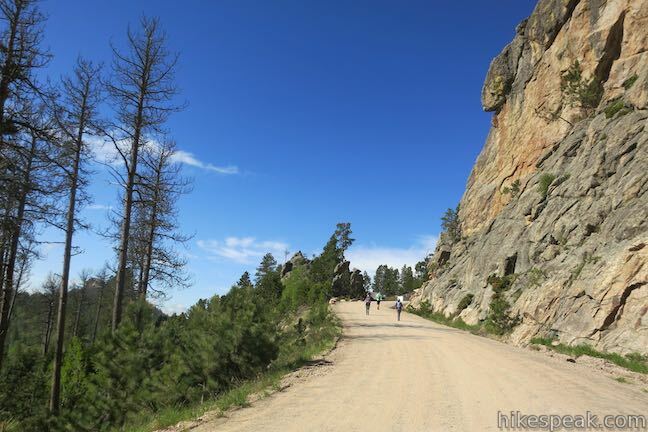 The trail is open from 8 a.m. to 4 p.m. and designed as a self-paced activity for individuals and families of all fitness levels. 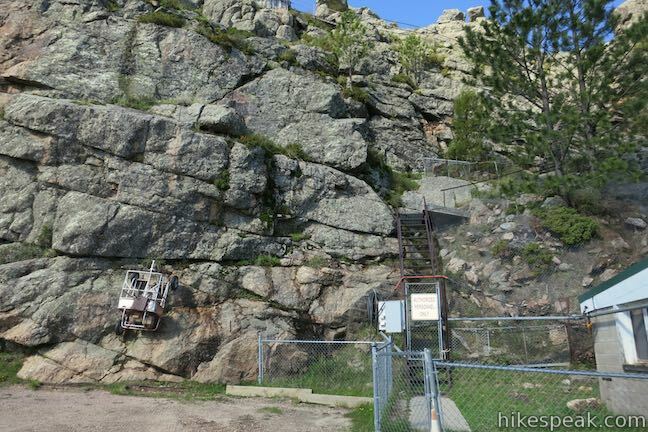 However, the trail is rough at times and inappropriate for strollers. 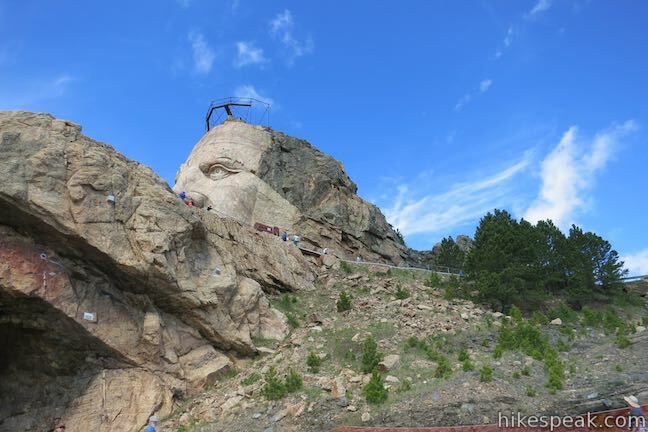 The finished monument will be over 500 feet tall and the trail crosses terrain below the memorial for a total of 775 feet of elevation change. 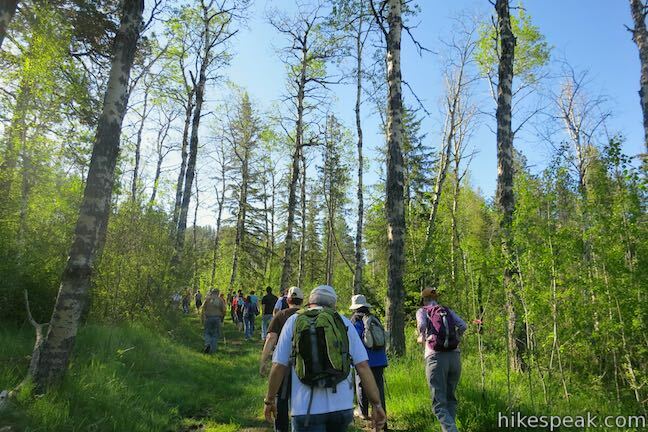 The volksmarch is described as a 10-kilometer (6.2-mile) hike. 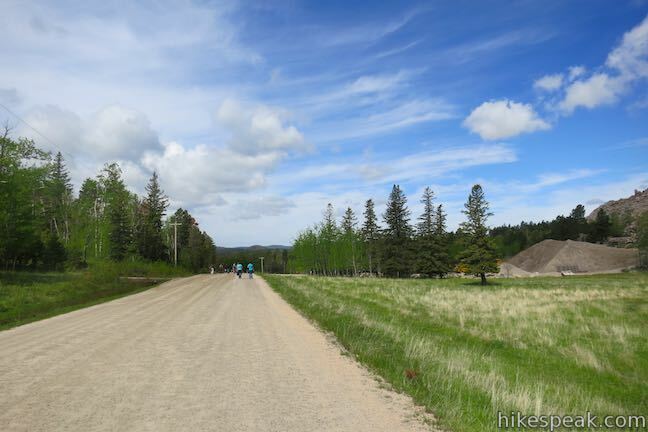 However, the route can vary year to year, so the actual distance may be under 5 miles. 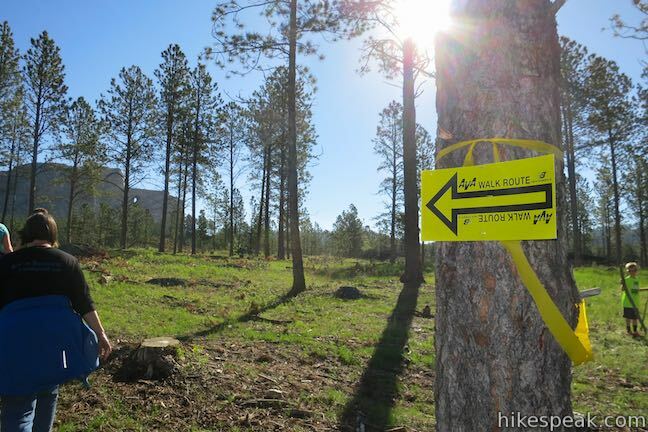 You do not have to worry about getting lost, as the trail is easy to follow with plentiful signage and people. 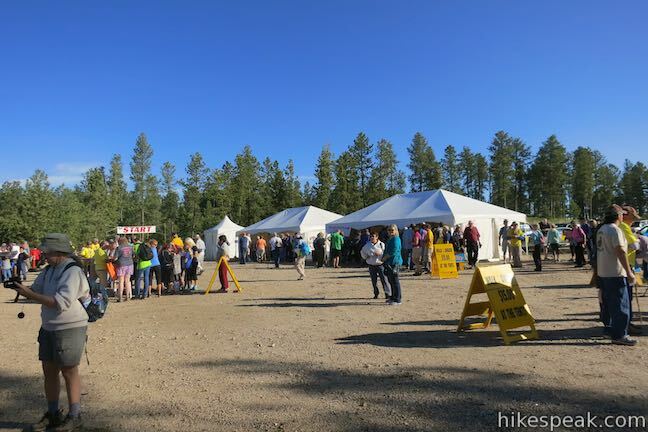 There are even four rest stations dispersed along the trail that offer free water and portable toilets. 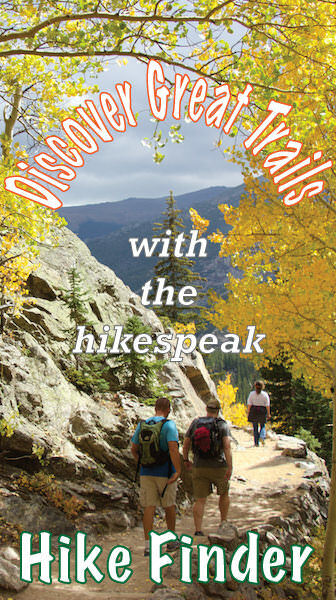 After paying a $3 registration fee, all hikers receive a trail pass that is quickly stamped at each rest stop. If you need an energy boost, you can support local organizations by purchasing snacks at these locations as well. 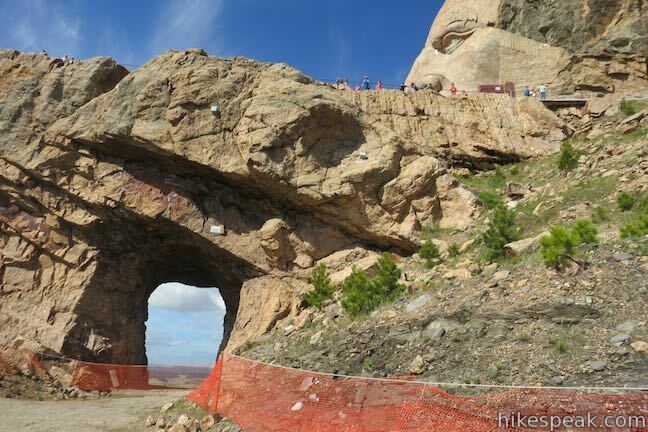 The trail starts from the main parking lot, beneath an event arch. 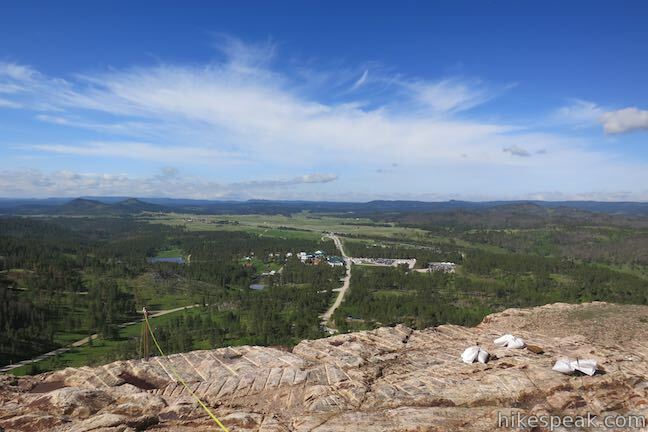 Although the top of the monument is less than two miles away, the trail meanders through fields and woodlands on the foundation’s property for nearly three miles before reaching Crazy Horse’s arm. 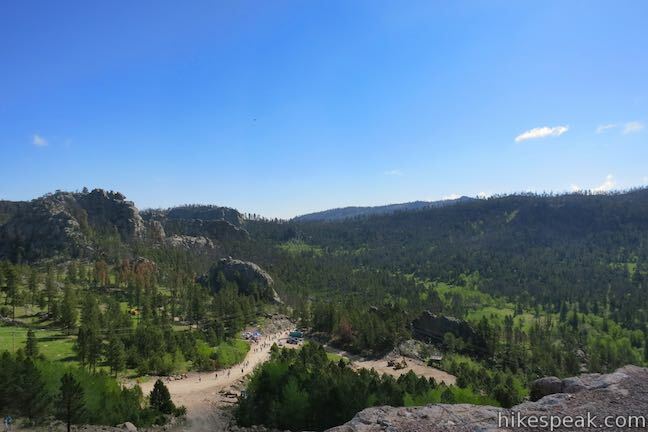 This indirect route may frustrate eager hikers, but it offers time to soak in the beauty of the Black Hills while spacing out the crowd before reaching the monument. 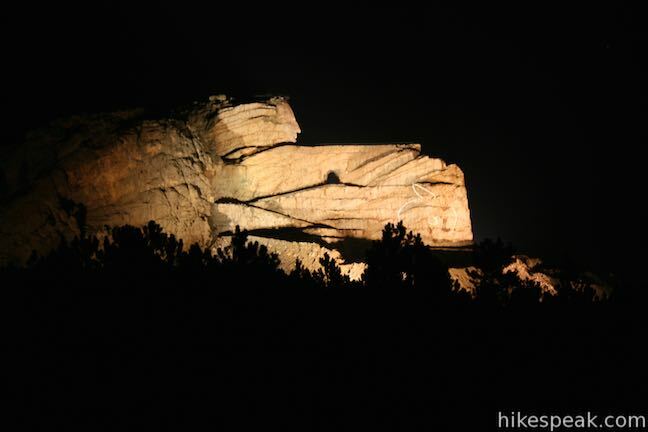 Shortly after leaving the parking lot, the trail gradually descends 215 feet and comes to the first checkpoint at 0.6 miles. 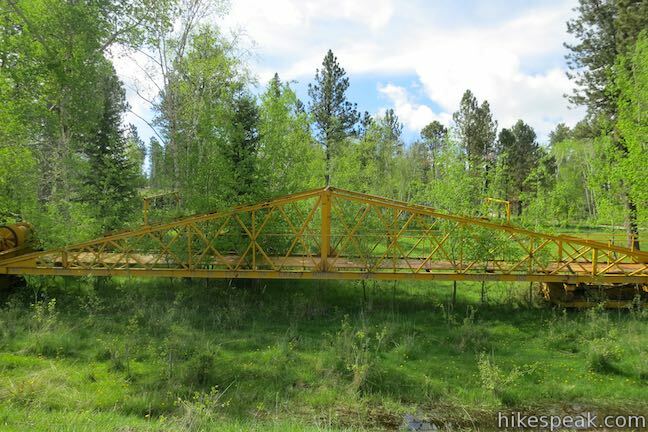 Get a drink of water and a stamp on your trail pass before proceeding up the trail, which climbs steadily for a half mile back up to the starting elevation of 5,960 feet. 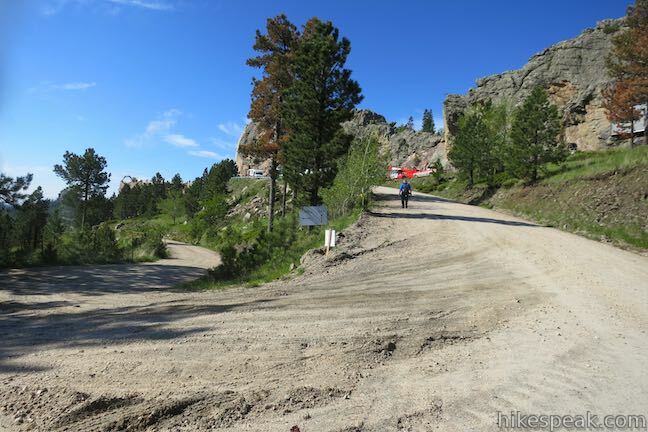 The route is a mixture of dirt roads and grassy trails as it zigzags along the hilly property. 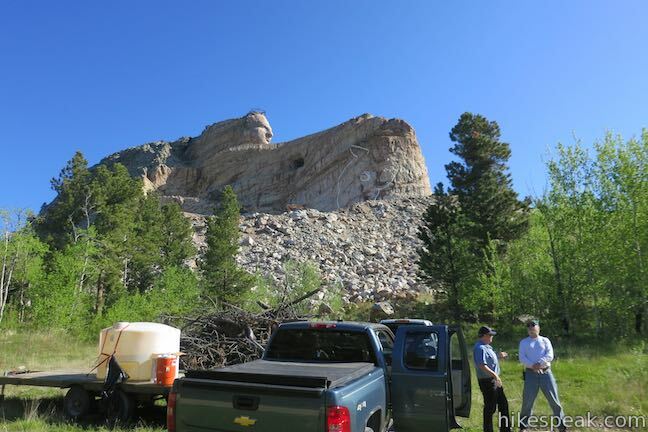 The next two checkpoints come quickly at around 1.45 miles and 1.9 miles and offer intermittent closer-and-closer views of the monument. 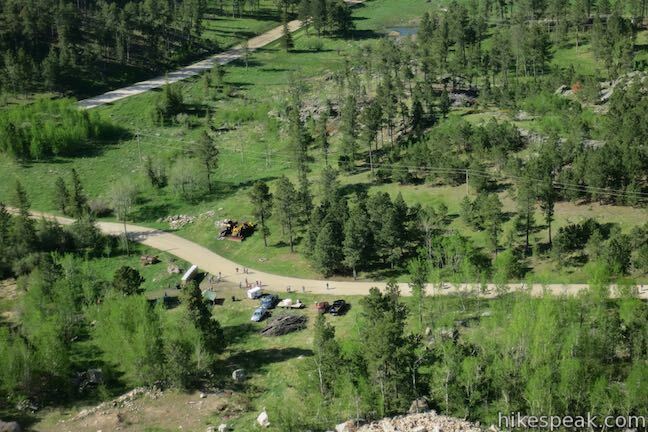 After the third checkpoint, the trail wraps around the base of the monument adjacent to construction equipment and meets the main access road, turning left. 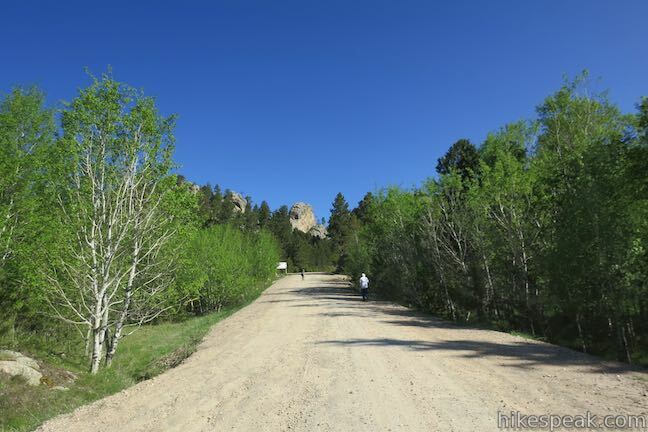 This wide, sunny, dirt road ushers in the hike’s main ascent, going up the back side of Crazy Horse. 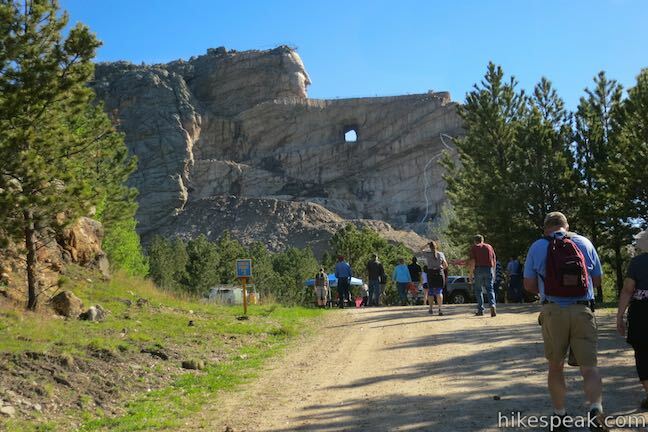 As the trail climbs, take in the rare view of Crazy Horse from the northeast, a perspective that is off limits to visitors on most days. 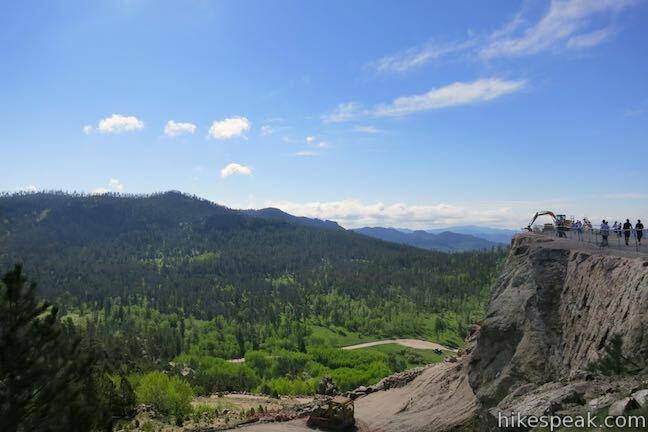 After a half-mile of climbing, reach the final checkpoint, 275 feet below the summit with 0.4 miles to go. Fill up on water if you need it and continue up the road. 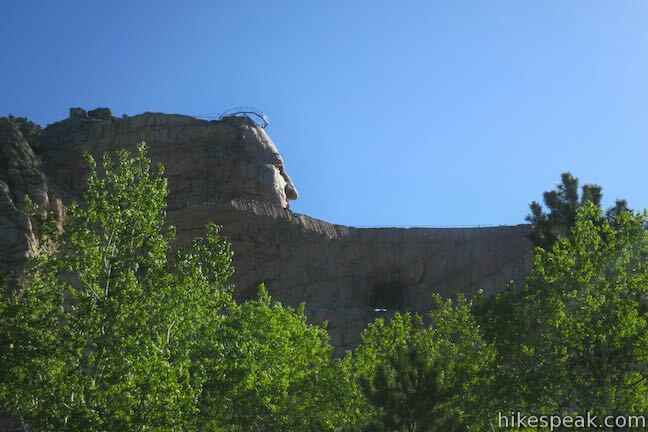 Shortly before the top, cross a side trail on the left that leads to the tunnel beneath Crazy Horse’s arm. 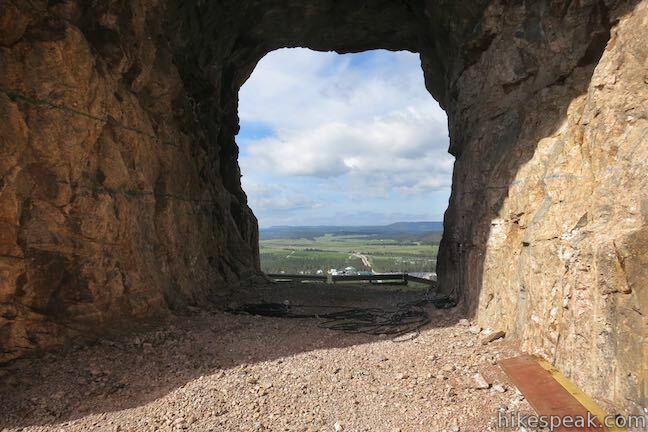 You can enjoy a short loop to the tunnel on the hike down. 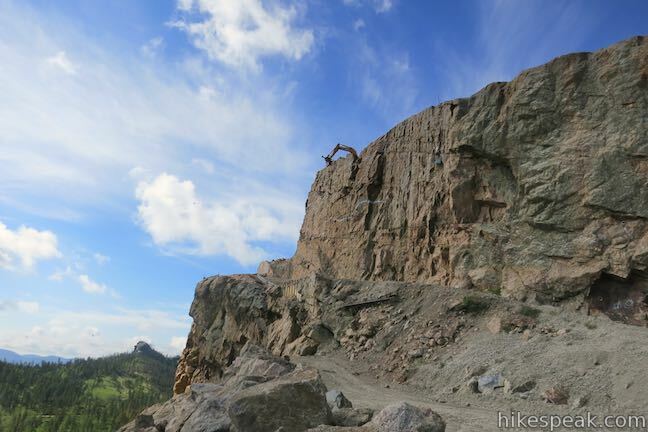 For now, stay straight and push for the top. 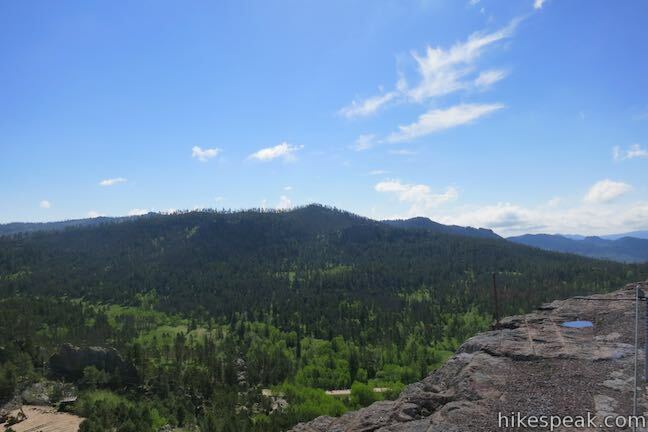 When you reach the high point of the hike, walk out onto the arm and enjoy panoramic views of the Black Hills. 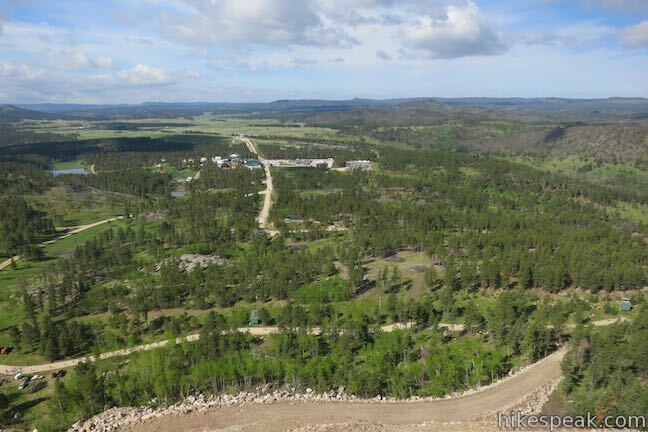 Surrounding you are waves of green mixed forests broken up by lumpy granite hills. 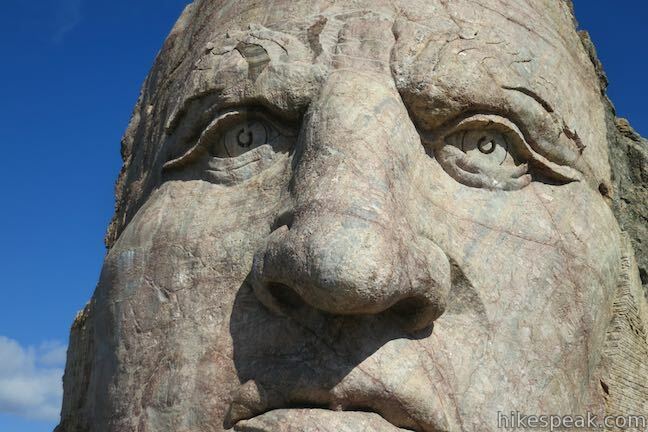 This perspective makes it easy to appreciate the history of the Lakota and understand why this land is so special. 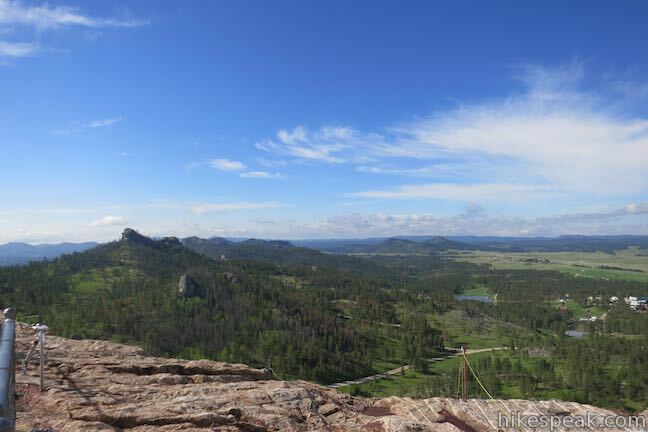 The Black Hills definitely look majestic while standing on Crazy Horse’s arm. 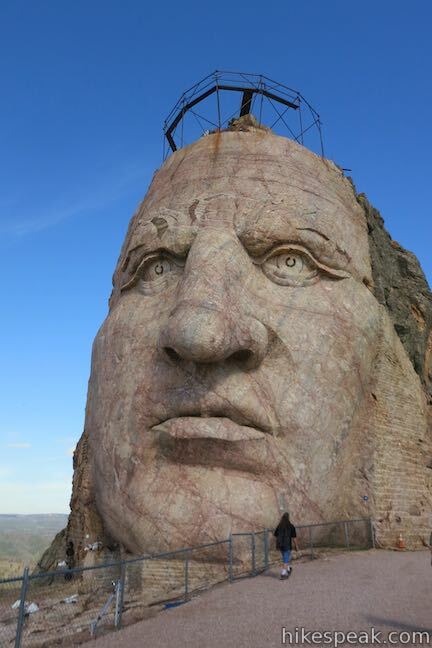 Standing on the arm, you can also lock eyes with the 87-foot face of Crazy Horse, a fully carved and finished section of the Crazy Horse Memorial just above the arm. 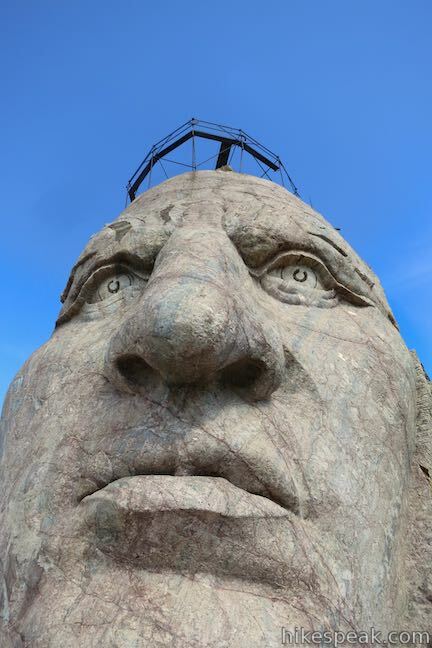 Getting this close view of the enormous, inspiring face is a definite hike highlight. 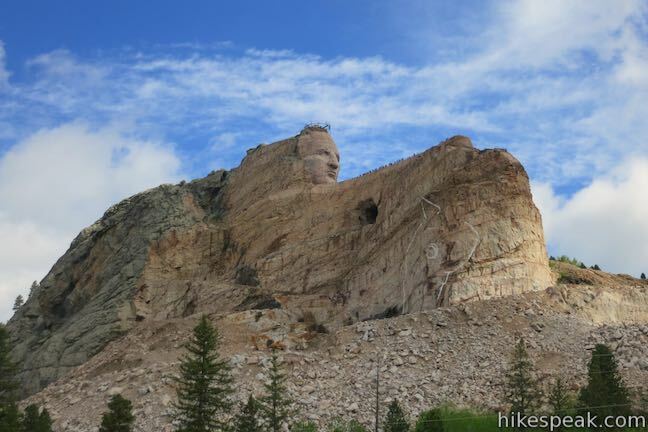 Crazy Horse was never photographed. 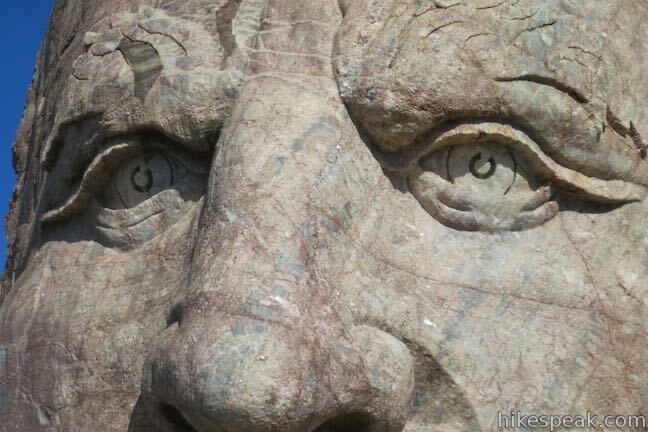 However, the sculpture was designed off a drawing and documented descriptions. 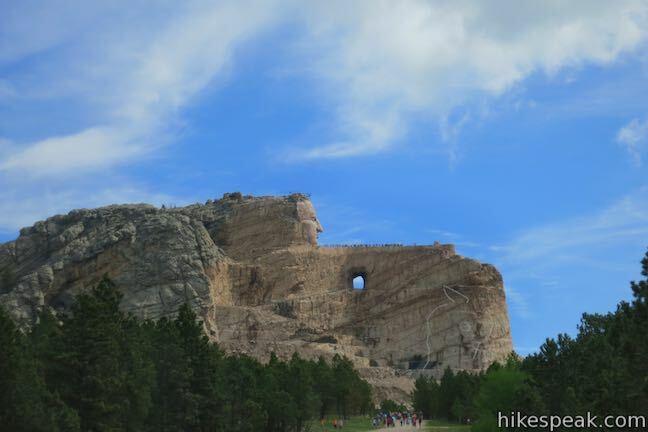 Once you feel ready to start the return trek, walk a short distance back down the trail and take the first right to the tunnel view under Crazy Horse’s arm. 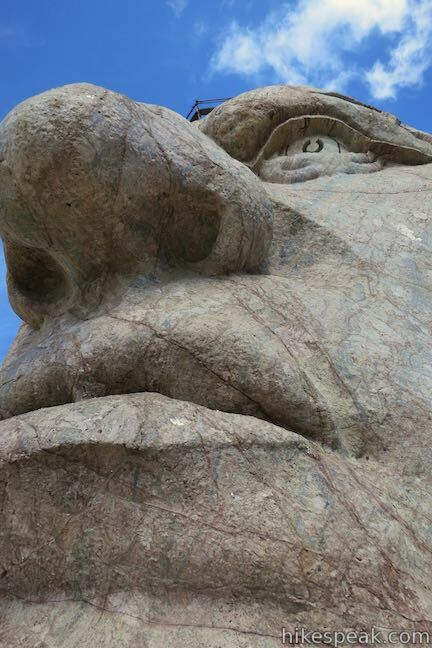 From here you get a closer look at the sculpture’s hand, which is the next part of the monument that will be detailed and finished. 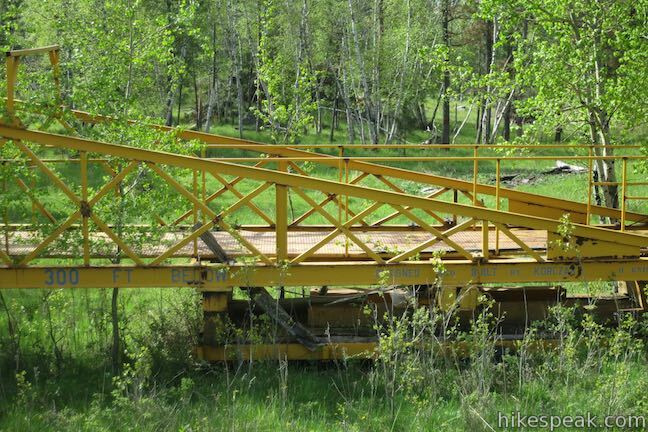 Continue down this small side loop until it rejoins the main road in just a few hundred feet. 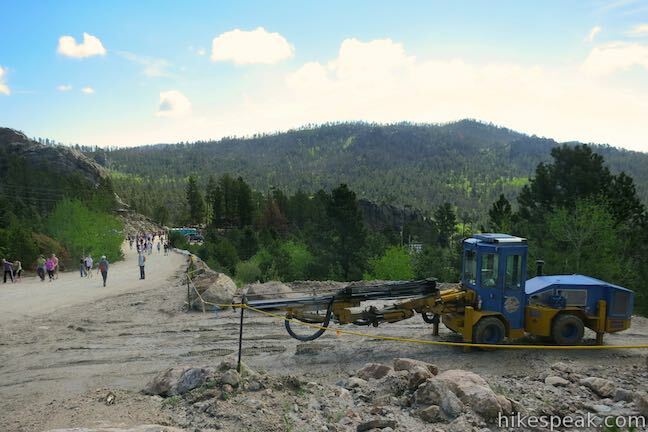 On the hike back, stick with the main construction road on a direct route back to the parking lot and visitors center. 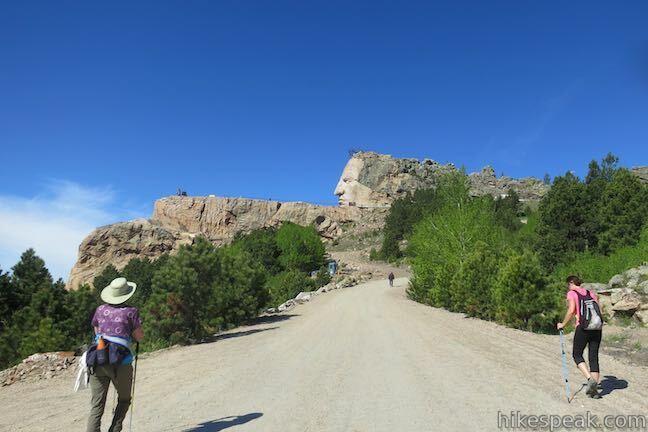 This quick, 1.5-mile long return follows much of the same path taken by the tour bus and offers unobstructed views of the monument whenever you look over your shoulder. 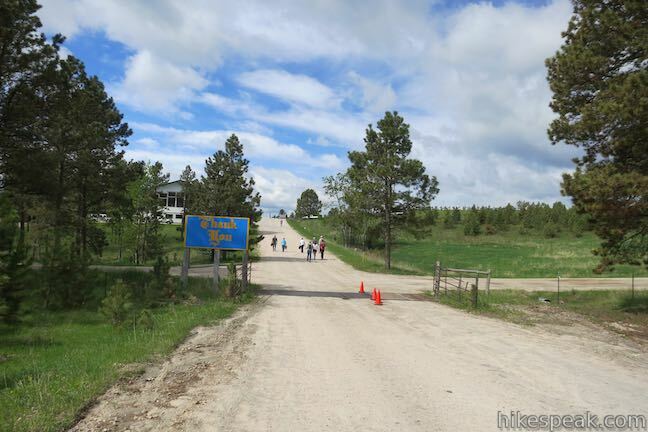 The road leads right to the entrance of the visitor center and museum which are free to hikers. 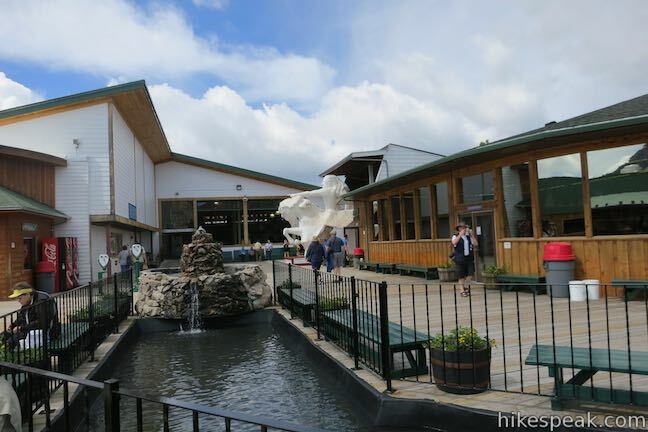 If this is your first time visiting, be sure to watch the welcome video and explore the museum. 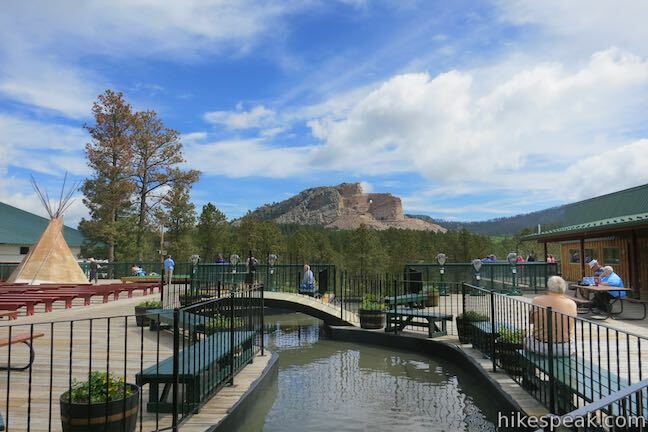 There is also a restaurant and free coffee if you need post-hike nourishment or just want to sit outside on the viewing veranda and take in the sights of the monument and hiking grounds. 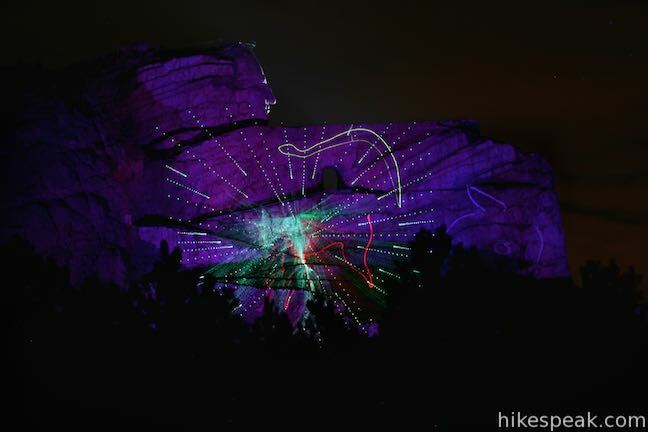 If you come back in the evening, you can watch the Legends in Light Laser Show at Crazy Horse Memorial. 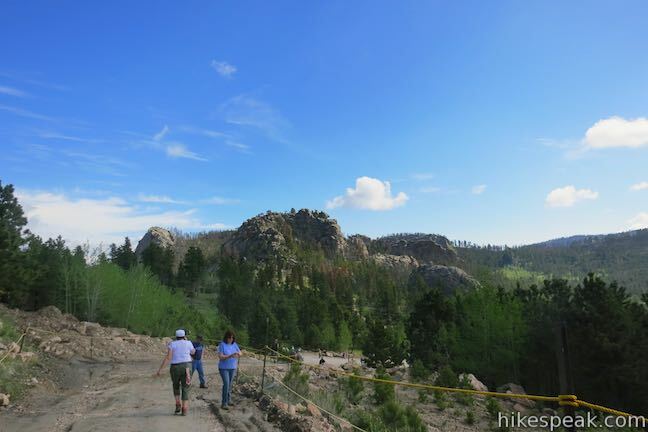 The trail is open annually, 3 days a year during the last weekend of June and the last Sunday in September. 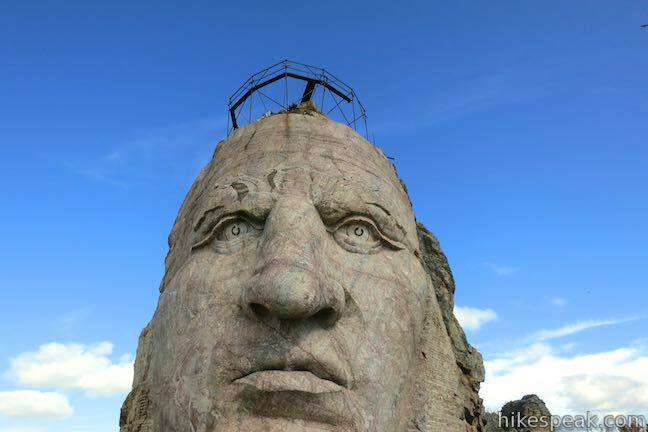 Be sure to check out the event website for up-to-date information for Crazy Horse Volksmarch. 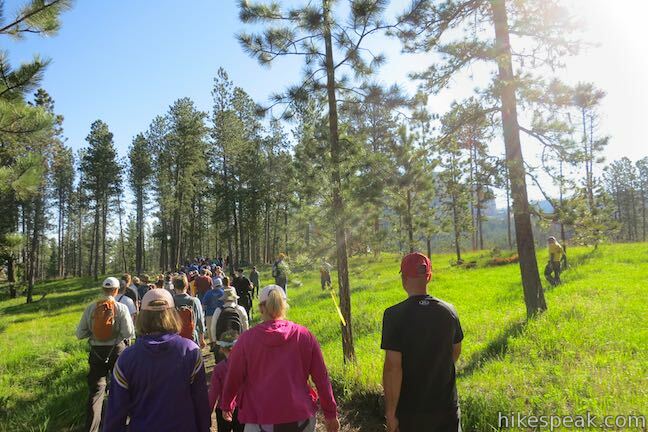 To participate, all hikers must register on the day of the hike and pay a $3 fee (price as of 2018). 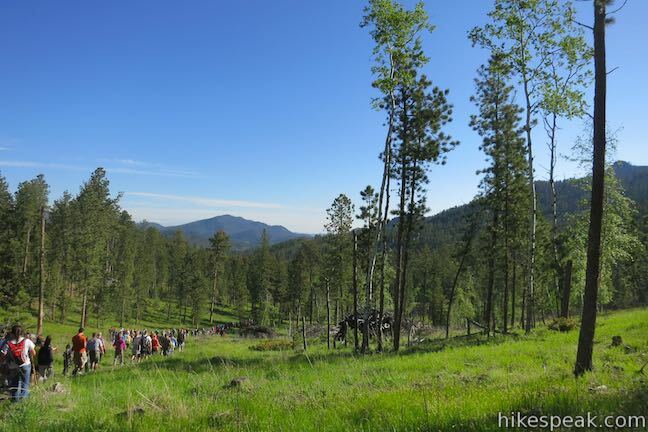 In return each hiker receives a trail pass that is stamped at each check point. 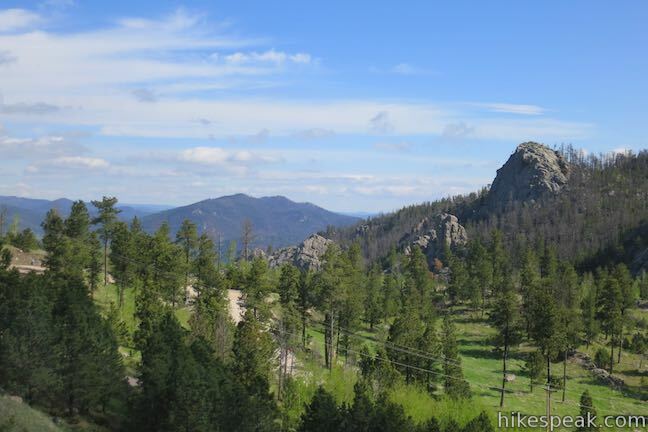 It may be possible to purchase medallions to commemorate this bucket list hike for an additional $12 . 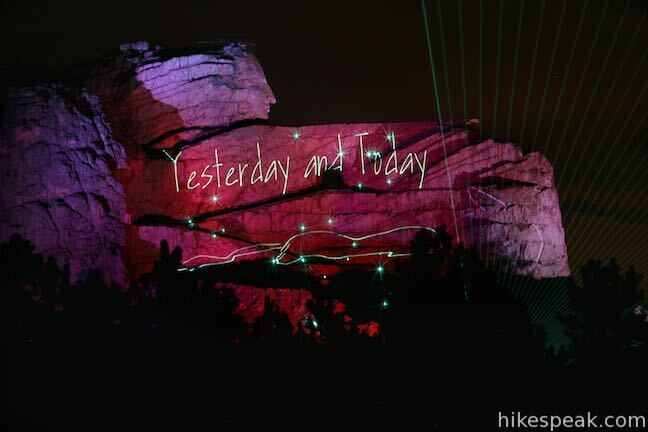 Commemorative T-shirts are also typically available at the end of the hike. 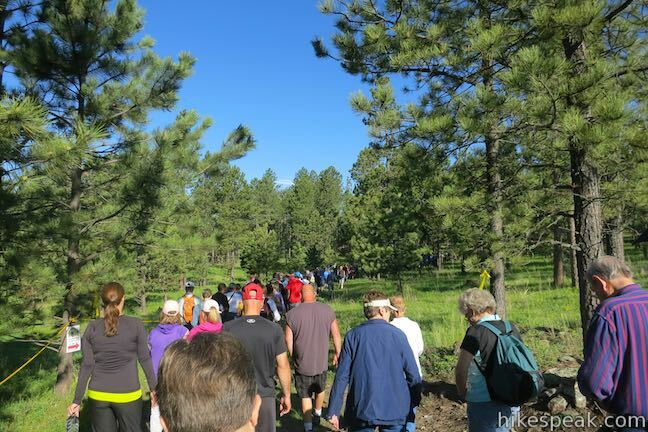 The hike is sponsored by the American Volksmarch Association, a non-profit organization that aims to provide noncompetitive fitness activities for all ages and abilities. Dogs and bikes are not allowed. 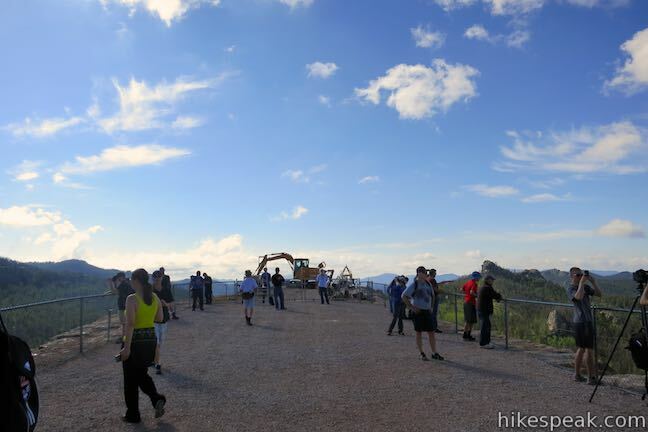 The trail is open from 8 a.m. to 4 p.m. with the last hikers allowed to start at 1:00 p.m. On the day of the march, the memorial opens at 6 a.m. (hours of operation on other days change throughout the year). 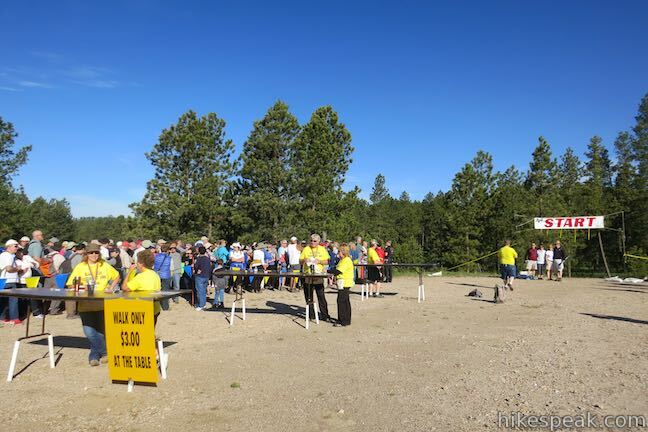 Those who arrive early will be able to park in the main lot adjacent to the trailhead. 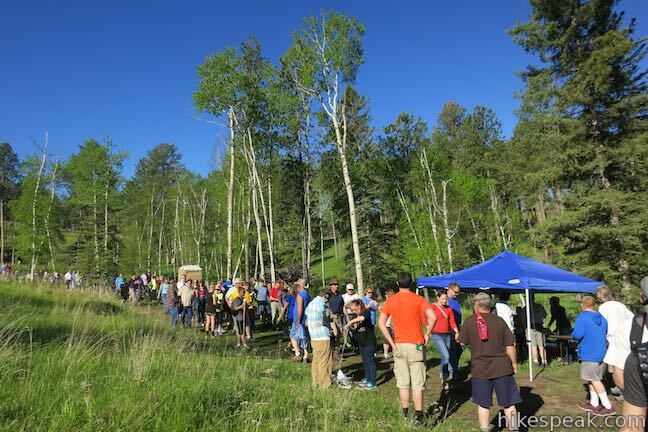 However, latecomers may need to park in distant event parking lots and take a free shuttle to the hiker registration area. 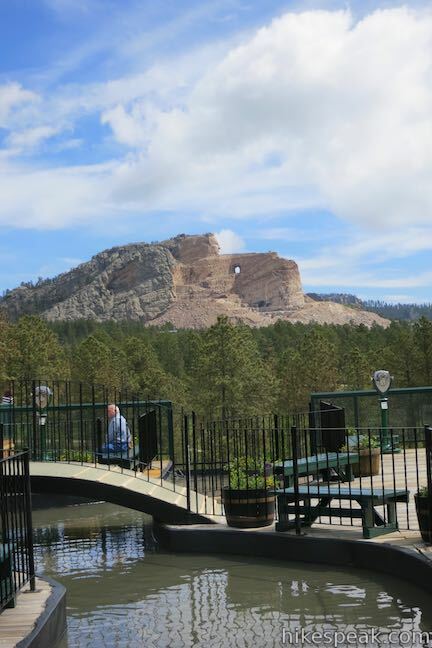 Typically, there is a $22 to $28 vehicle entrance fee for the monument that supports the Crazy Horse Memorial Foundation. 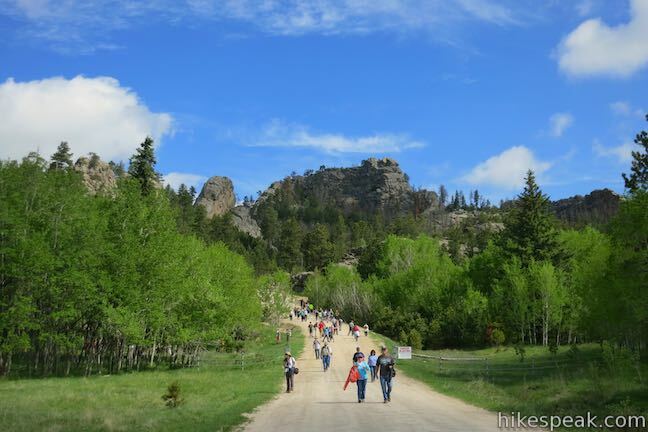 However, on the day of the Volksmarch, the fee is waived for hikers and entrance is free. 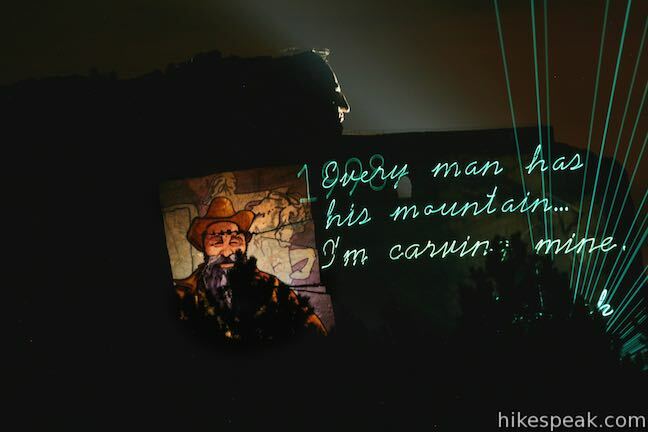 In exchange, hikers can make a donation of 3 canned goods per person to support the KOTA Care & Share Food Drive. 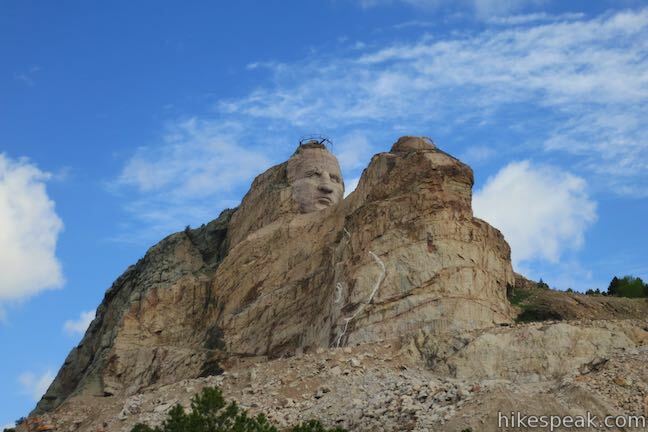 To get to the trailhead: Crazy Horse Memorial is 15 miles from Mount Rushmore. 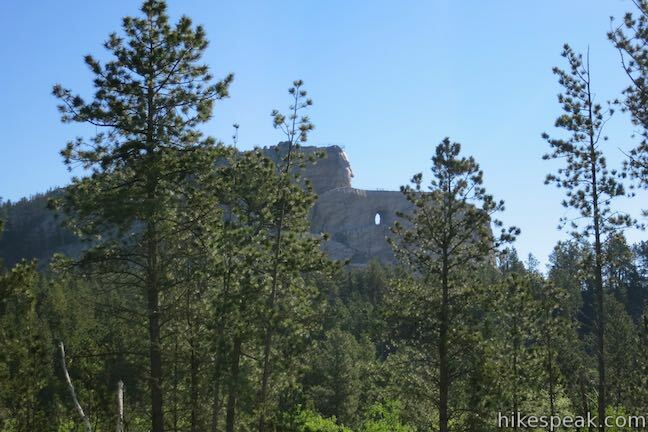 From Interstate 90 in Rapid City, take exit 57 for Interstate 190 (Route 16) and drive south following signs for Black Hills National Forest and Mount Rushmore. After 1.3 miles, turn left onto Omaha Street (Route 44 E). 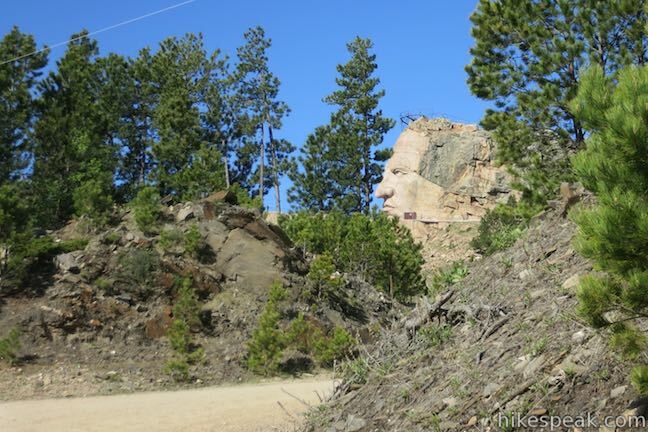 Go 0.2 miles and turn right to continue south on Route 16 toward Mount Rushmore. 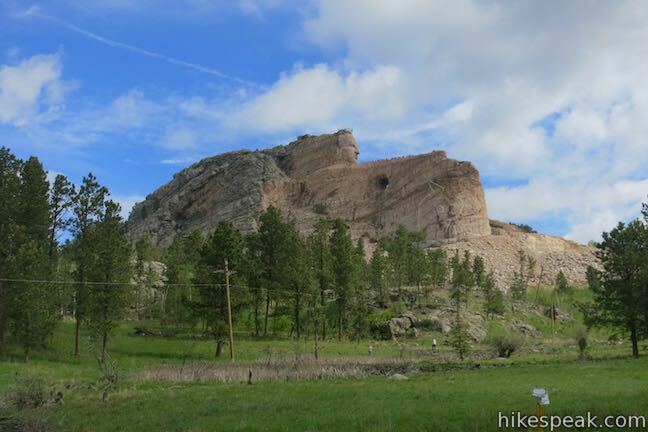 Stay on this route for 36.5 miles to reach Crazy Horse Memorial, which will be on the left, nine miles south of Hill City and 4.5 miles before Custer. 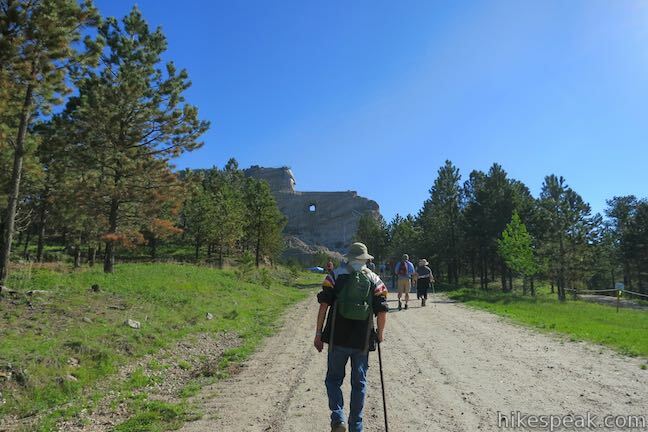 Or view a regional map of surrounding South Dakota trails and campgrounds. 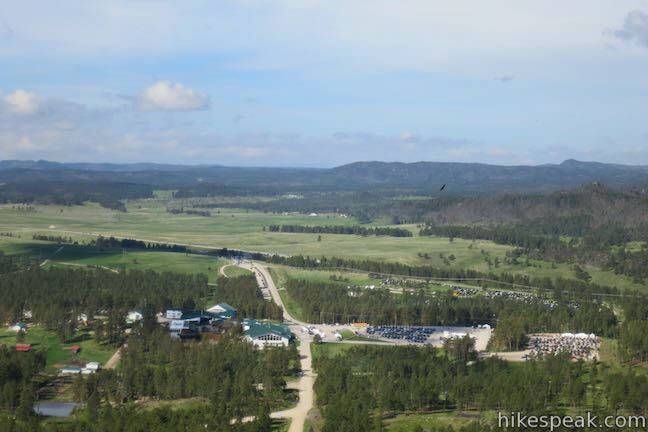 This one-mile loop hits the highest point in the park at a lookout tower with views over the east side of the Black Hills.